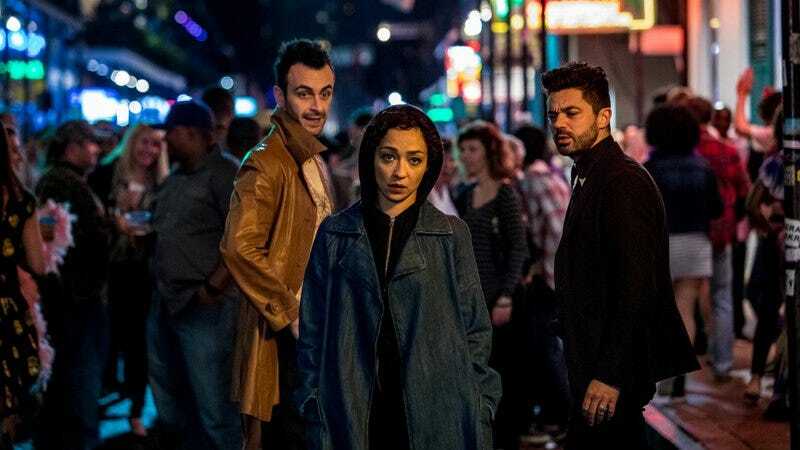 Preacher’s search for God has led Jesse, Cassidy, and Tulip down to New Orleans in season two, where the Almighty is apparently hiding out and grooving on some jazz. Before they got to the Big Easy, though, we saw the gang pooling their resources, with Jesse using the Voice (to varying effect), Tulip slapping around an old co-conspirator, and Cassidy getting an angel high. In tonight’s episode, “Damsels,” they’ll split up on individual pursuits, as Jesse remains intent on calling the Lord to account, but Tulip has her own troubles. As usual, Cassidy skirts responsibility while also sticking his nose in his new friends’ business. But in this exclusive “Damsels” clip, the vampire proves surprisingly helpful. Cassidy arranges for all three God hunters to crash with his old friend Denis, who’s played by European gentleman extraordinaire Ronald Guttman. In addition to disproving that old bit of vampire lore about the undead needing an invitation to cross your threshold, this clip could also tease the introduction of the New Orleans arc from the comics. Either way, things are about to get a lot tenser for everyone involved. Preacher airs tonight at 9 p.m. ET on AMC.